New watches Aquaracer 500M Ceramic, presented in 2012 the well-known Swiss company TAG Heuer, made in a restrained classical style of diving. New released in several versions: blue dial and steel bracelet with gold-plated, black dial and ceramic bezel, blue dial and blue bezel. The round building new diameter of 41 mm made of stainless steel. On the front of the building is protected by sapphire crystal with anti-reflective coating, which is attached to the body through the unidirectional rotating bezel made of ceramic and graded diver markings. The back cover model for the strength of screwed into the body. Secure the tabs on the case the crown is installed in the position of 3:00. The helium valve is so necessary in diving watches, located at position 10:00. The case is waterproof to 500 meters. Time is indexed on the dial, decorated with horizontal stripes, with the help of the central arrow hours, minutes and seconds, covered with fluorescent coating of white. Dial markings in the form of invoices and luminescent hour indexes. Date placed in the aperture in the 3:00 position. 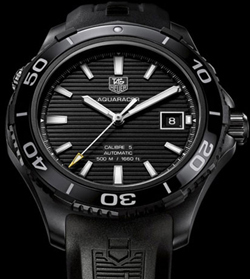 Model Aquaracer 500M Ceramic operates on the basis of the manufacturing machinery TAG Heuer Calibre 5, which provides the function of indicating hours, minutes and seconds. Novelty comes in the natural rubber strap or steel bracelet. 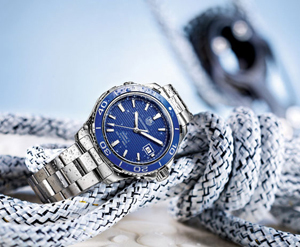 You can buy watches from authorized representatives of TAG Heuer.